It doesn’t have to be Christmas to treat a friend or family member with a gift. I believe that we should spread love all year round and not just when we feel we must. Therefore, I’ve put together a list of a few gifts that any pontoon boat owner will love! As a boat owner, myself, I’d very much appreciate any of these gifts. In fact, I have been gifted items like those on this list and I was thrilled. The thought of someone buying me a gift with some thought behind it alone made my day. Gifts like these are meaningful as you’ve identified someone’s love for their pontoon and bought a gift around that. This is much better than purchasing any old stuffed bear that was on sale at Walmart. These pontoon boat gift ideas are very inexpensive, however are guaranteed to put a smile on the face of anyone who loves their boat. This list will consist of small and larger presents, so regardless of your budget – there will be something for you. A shirt had to be somewhere on this list, so let’s begin with it. Not just any shirt but a Pontoon T-Shirt. I have a couple pontoon related T-Shirts, you just simply cannot go wrong with them. They don’t have to be the most stylish thing in the world, it’s just something to rock whilst out on your vessel. There are plenty shirts with great, appealing designs. I’ve linked one of my favorites. It comes in multiple different colors and sizes. You should be able to find one that your friend will love! If you’re feeling generous, you could purchase them a pontoon cap to match their T-shirt. Not only is this a cool gift but it also has practical use. Wearing a cap whilst boating can help keep the rays of the sun out of your eye. I really like this trucker cap I’ve linked. This is a classic style for those casual summer days out on the water. It has a mesh backing which provides great ventilation. This cap will keep the receiver cool, whilst adding some flare to their outfit. 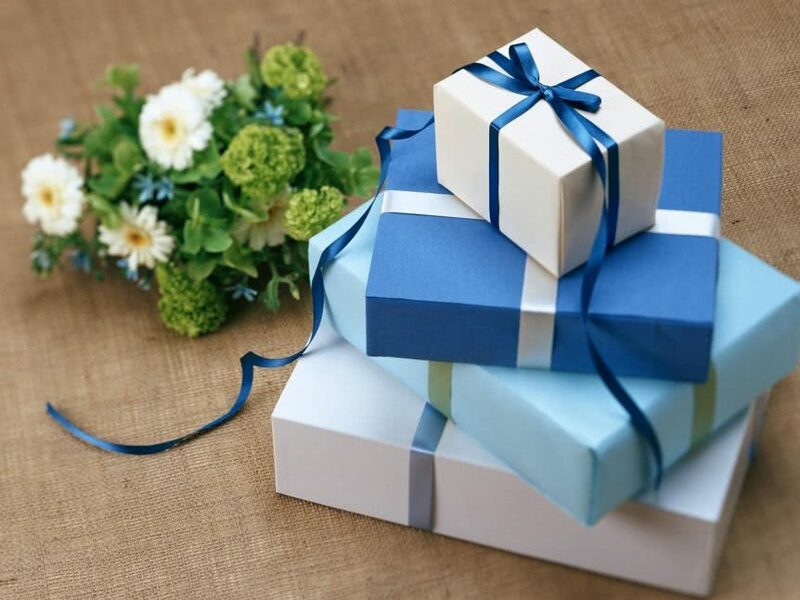 The receiver of the gift will be thrilled to know you’ve purchased them such an amazing gift. A pontoon styled ornament can be a great gift. I get a lot of these ornaments from friends and family because they know about my boating obsession. I keep a lot of them at home on my desks and shelves, and some I even keep on my boat. Children love these! They’ll play with it all day as if it was an action figure. Also, if purchased for Christmas, the ornament will look great on your Christmas tree. It’s not a small piece, it measures approximately 3’ so it’s sure to stand out on your tree. Children love to decorate a Christmas tree. This is a sturdy ornament which should put up a good fight. You’ll find that many cheap ornaments can be broken without little effort. Though, this one is manufactured from quality resin material. Meaning, it’s most likely to survive a fall whereas a glass ornament would almost definitely smash into pieces. Not a big fan of this design? There are plenty others such as this Cape Shore Santa and Reindeer Party Boat Christmas Ornament. Flip flops are any boat owners’ best friend. When boating during the warm seasons, these are almost an essential. Shoes can be too heavy and lack enough ventilation, flip flops keep your feet nice and cool when walking around on deck. They’re made from quality foam rubber and feature soft polyester tops with contoured rubber straps which provide outstanding comfort. They’ll also work perfectly as beach, party or pool slippers too! These flip flops would make for a great gift for the whole family! What’s better than sitting back on your boat with your favorite people enjoying a delicious BBQ with some cold drinks and tunes? I’m telling you, if you don’t have a grill on deck, you’re simply missing out. There are several BBQ grills designed specifically for pontoon boats. They simply mount to the railing of your vessel with pre-installed brackets. Installation is as easy and simple, anyone can do it and it doesn’t require any tools. I’ve recently produced an article in which I reviewed a few of the best pontoon boat grills on the market. You can find that article by clicking the link above. I produced comprehensive and detailed reviews of each grill and provided links to each product. I’d highly recommend that you give it a glance if you’re interested in purchasing one as a gift or even for yourself. In my opinion, I feel like a dry bag is an essential bit of equipment. A dry bag is something that every boater should already have, however I’ve always been surprised as to how many boaters don’t use dry bags. Do your loved one a favor and get them a dry bag. As the name suggests, it’s a watertight bag that keeps things dry. They work wonders, keeping your equipment completely dry no matter how bad the weather is. These are perfect for storing your spare clothes and towels inside of. The dry bag I’ve linked to is the DrySak by Såk Gear. This is by far my favorite dry bag on the market. It works amazingly well and has never let me down, ever. It is made from a heavy duty 500-denier PVC which does a great job of sealing out the elements and thus keeping your gear protected. It features a splash proof outer zip pocket which allows you quick access to your small essentials without having to rummage through the bag. It also features a reflective trim to keep you visible and safe during the night. This also makes it easy for you to find your bag whilst it’s dark. 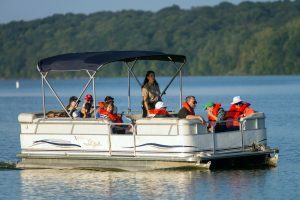 Know someone who commonly uses their pontoon boat for fishing? If so, then this is a gift worth looking into! Fishing rod holders, as the name suggests, holds your fishing rods. Regardless of their level of experience fishing, this is a gift which all fishers will appreciate. You don’t need to go out and buy an extremely expensive model, the holder which I’ve recommended will do the just perfectly. Being able to keep your hands free whilst fishing is a luxury which comes at a cheap price. Though this isn’t a rubbish cheap rod holder, it’s made of very high quality and eco-friendly materials. It features a universal fit, accommodating for many different handle types. It has a large which will clamp to anything you want. This is another gift for those who enjoy fishing in their free-time. For the most enjoyable fishing session, it’s important to be prepared with the correct gear. Fishing sunglasses is one of those items. Fishing sunglasses keep the sun out of your and make it easier to keep your eyes open whilst out at sea so that you can enjoy the beautiful views. It’s also important in keeping your eyes protected from the harmful rays produced by the sun. I would not recommend fishing without a good pair of sunglasses. Finding the best pair isn’t easy, and it’s even harder to find those that provide the best bang for your buck. Lucky for you I’ve produced a detailed guide in which I review the top 5 fishing sunglasses on the market. If you’re interested in purchasing some sunglasses, then I’d highly recommend you check out this resource. It doesn’t matter how safe you think you are or how good your grip is. Accidents always happen, especially when it comes to the wet conditions of boating. It doesn’t even take you dropping your phone in the water to damage it, a splash is enough to destroy your phone. Therefore, it’s important to be one step ahead of the game. Waterproof phone cases are now a thing and are widely used for any type of aquatic activity. I’ve linked to the CaliCase Waterproof Floating Case. This is an outstanding floating case, available in multiple different colors. It features 2 layers of high quality PVC plastic that will provide maximum waterproof protection. There’s little to no chance of water getting into this thing. This case allows you to take videos and photos without a problem, with its double-sided clear windows. This is waterproof up to 100 feet underwater. Also, as the name suggests – it floats! This is an amazing feature as it means if you do drop your phone in the water, you don’t have to stress about it sinking and being lost forever. It will simply float safely on the water for you to retrieve. This is an extra-large size, so it should be able of fitting pretty much any type of phone. It’s so large you it can also accommodate for whatever phone case you already have on your phone. You may even be able to store a few small valuables that you may want to keep safe. Floating keychains are extremely useful for us boating enthusiasts however can be useful for casuals too. They’re very simple devices which allow your keys to float. Imagine the pain of losing your keys out on the water and having them sink straight to the bottom. If this happens, they’re gone with close to zero chance of retrieval. The loss of keys can be such a headache, they could be the keys to your house, your garage, your shed, the boat itself or all the above. Therefore, it’s important to protect yourself so that a situation like this doesn’t occur. I’ve linked to a very inexpensive floating keychain, though It works extremely effectively. For such a little cost, you’ll save yourself or the receiver of the gift, a ton of headache and money. I’ve recommended Chums’ floating key-chain. It’s a simple foam and stretch TPU construction. It comes in a highly visible yellow color with black split ring. It’s recommended that you test it in a shallow water before heading into deep water.